Feeling “butterflies in your stomach”? The chances are you’re either desperately in love with someone or just worried or excited before a rather important event in your life. Why not express that strangely beautiful feeling in a photo? We don’t ask you what gives you that ‘butterflies in my stomach’ feeling. Because what we really want is to give you a chance to express your excitement by setting those wispy fluttering creatures at liberty. At least in a photo. Intrigued? 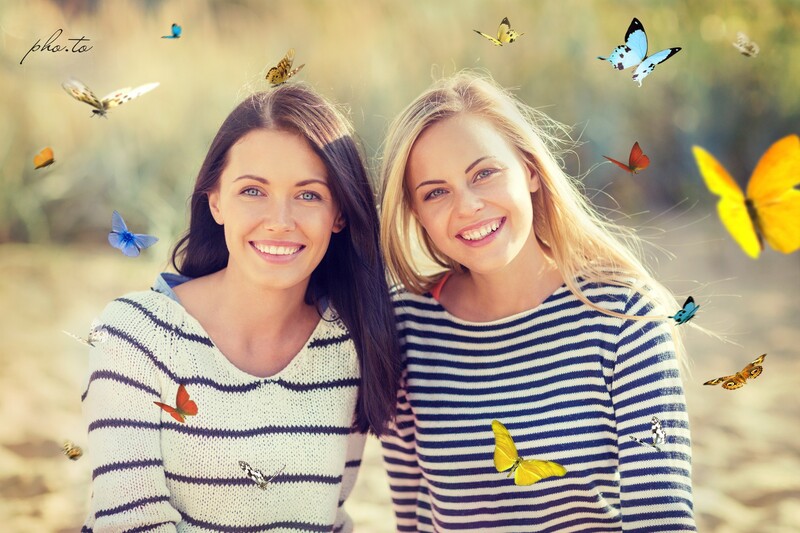 Then give our light and lovely butterfly overlay a go with any photo of yours to instantly show what you feel inside. 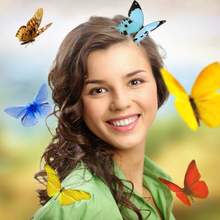 It will add many flying butterflies of various kinds and colors to your picture. And we should say that it’s quite a burst of colors: blue, yellow, red, black-and-white, orange and more. This overlay can also be used to emphasize the summer mood of your vacation photos. Especially those taken in the countryside fields or wood meadows. Love butterflies? There are more effects and frames you’ll definitely fall for on our site. Check Spring Window, Spring Bliss, Orange Butterfly photo frames, Antique Butterflies vintage photo effect, Butterfly Shape Collage and Tropical Butterflies photo background.